This fashionable Ladies' Men's 3-hand Citizen quartz watch crafted in sleek stainless steel. The sumptuous gold tone bracelet strap is, wonderfully offset by the and casing are perfectly complimented by the off white tone dial, set with dazzling crystals. The perfect wrist companion for the style conscious woman, always on the go. This set also includes a beautiful crystal encrusted bracelet, the perfect accessory to match your watch. 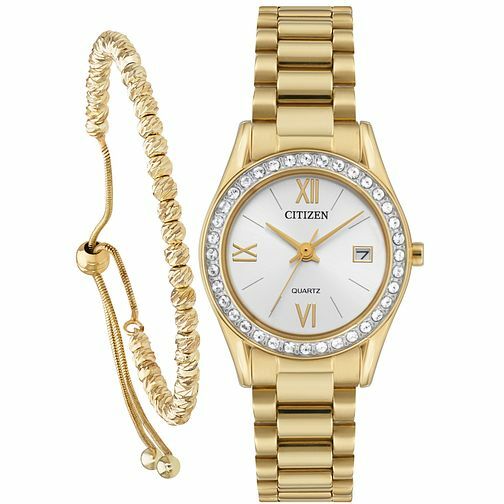 Citizen Ladies Quartz White Dial Watch and Bracelet Set is rated 4.8 out of 5 by 5. Rated 4 out of 5 by Anonymous from Great watch Great watch. money worth the value. Good quality. i would recommend this to other. Rated 5 out of 5 by Anonymous from A very desiresble gift set This watch and bracelet set is a gift for my partner. I chose it because it was a beautiful set that oozed quality and class. It also represented value for money. I am very happy with my purchase as I am sure my partner will be with it as her gift.